Ever since I was a little girl, Valentine’s Day has been a special holiday to me. During my childhood, I remember making mailboxes in school to collect all of the red and pink heart-shaped cards from my classmates. As I grew into my tween and teen years, my family emphasized the importance of celebrating friendship and appreciating loved ones. Valentine’s Day, therefore, wasn’t just about romance. As a result, I never resented Valentine’s Day if I didn’t have a “sweetheart” sending me chocolate and writing me poetry. Now that I am a mom, I hope to cultivate the same sentiments about Valentine’s Day with my children. I also hope to take it to a deeper level by incorporating the most precious love of all: the love of God. In an age when the true sense of sacrificial, unconditional love has been snuffed out by feel-good movies, sappy love songs, and selfish ideas of happiness, we need reminders of God’s definition of true love and ways to express it now more than ever. Introducing Salutare Stationery’s new line of Valentine’s Day cards! Last summer, I ran into my friend Jolene Schmitz, founder of Salutare Stationery, at a conference. 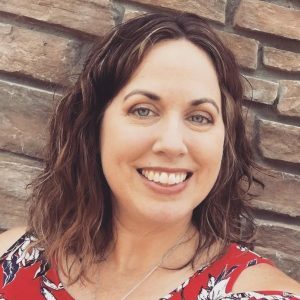 She was there to display her one-of-a-kind faith-based greeting cards, and I was so excited to see that she added a line of Valentine’s Day cards to her collection. Now that Valentine’s Day is only a couple weeks away, I want to introduce you to these adorable, festive, and Christian cards, so you can share them with your family and friends. Salutare Stationery’s Valentines include three different designs. The first is a line of saint-inspired cards that have a comic-book look. They are perfect for the classroom exchange. What I love about these is that they are virtue-driven in sentiment. So, for example, rather than saying, “you’re cute,” they read, “you’re brave” or “you’re a good friend.” Biographies of the saints are included, which can be added to the back of the Valentines with a glue stick, washi tape, or heart stickers. The second line is perfect for kids of all Christian denominations. They focus on names for Jesus. They tell His story through animal legends like the pelican and unicorn, as well as more familiar titles such as Lamb of God and Sacred Heart. Explanations of the legends and how they relate to Christ also are included and can be attached to the cards. Lastly, there is a line of Valentines that focuses on the Blessed Virgin Mary and the various titles she has, such as Bearer of the Word, Queen of Heaven, and Our Lady of the Rosary. These are more feminine and may appeal more to girls—even teens and women. When I asked Jolene about the inspiration behind the Valentine’s Day cards, she simply said, “the Holy Spirit.” She went onto explain that her family has always made their own Valentines, because her children did not want to give “lovey” greetings to their classmates. As a family, they cut out hearts and included holy cards to bring the saint back into St. Valentine’s Day. “On this holiday, card giving is the celebration. So, we hope to use the day as an opportunity for kid-sized evangelization. 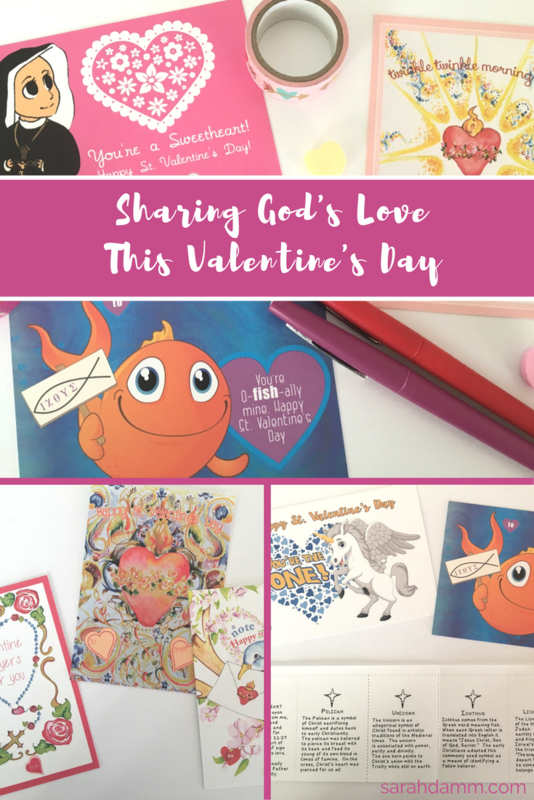 In creating the Valentines, we wanted them cute and catchy but backed up with depth of Scripture and tradition,” Schmitz said. All of the Valentine’s Day cards come with envelopes that can be sent through the U.S. mail with a first-class stamp. With Salutare Stationery’s new Valentine’s Day cards, families can regain the tradition of sending cards to friends, neighbors, and classmates. They can be reminded of the love Jesus has for them, and they can extend that sentiment of true love to their corner of the world. 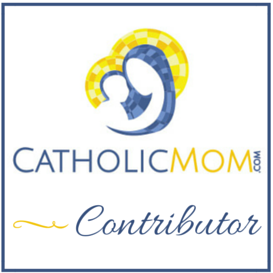 Salutare Stationery is offering a coupon code for all of my readers. Pick out your Valentine’s Day cards on their website, and use coupon code Val25 for 25% off your order. And if you do order some, please let me know which ones you selected in the comments below. These valentines are so neat! Thanks for sharing. I love what you said about not trying to make Valentine’s Day lovey-dovey, but using it as an opportunity to grow in the virtue of Christian friendship. My kids are going to LOVE sharing thsee cards with their friends at school. I think we’ll mail them to out-of-town family too. All three lines are so pretty and faith-filled, it will be hard to choose which ones are our favorites! I am so glad you like them, Erin! I definitely plan on sending the Mary ones to some of my friends! 😉 The kids ones are too cute, it will be hard for me and my kiddos to decide, too! I pray that you and your family have a wonderful St. Valentine’s Day! So cute! I like the idea of acknowledging and encouraging friendships and familial love too! I am so glad I saw this! I just started shopping for Valentine’s Day cards for my kids and was a little dissappointed with the choices out there. Until I saw these, that is. They’re perfect! I think our kids will enjoy sharing these and will even want to keep some for themselves! So glad you found this post and these adorable Valentine’s Day cards, Cynthia! I hope you and your family have a wonderful Valentine’s Day!